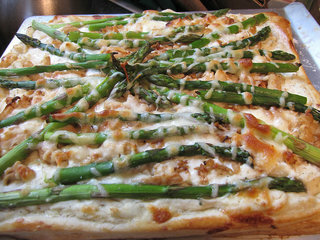 We’re sharing this delicious recipe for asparagus & gruyere tart to pay homage to this much-loved British vegetable. Why not serve it at a future event you may be planning? Heat the oil in a frying pan and sauté the onions until it is soft but not coloured. Leave to cool. Then break off the woody ends off the asparagus and cook in boiling water for 1½ minutes. Plunge into cold water, then drain well. Roll out the pastry and use it to line a 20x30cm non-stick tart tin or a 24cm round tin (a rectangular one works best with asparagus). Line with greaseproof paper and baking beans and cook in an oven preheated to 200°C/gas mark 6 for 12 minutes. Remove the paper and beans and return to the oven for eight minutes. Fill in any cracks with bits of leftover pastry. Then turn down the oven to 180°C/gas mark 4. Spoon the onion into the case. Mix together the other filling ingredients – except the asparagus – and season well. Pour into the tart case and lay the spears on top. Season and sprinkle on extra parmesan. Bake for 25 minutes, or until the filling has souffléed round the asparagus and is just set. Leave for 10 minutes, remove from the tin and serve. To add a meaty twist, sprinkle the tart with some pieces of cooked chicken. Enjoy with a crisp fresh salad for a real taste of summer! Photo courtesy of Mike Krzeszak on Flickr.